Hello, friends! 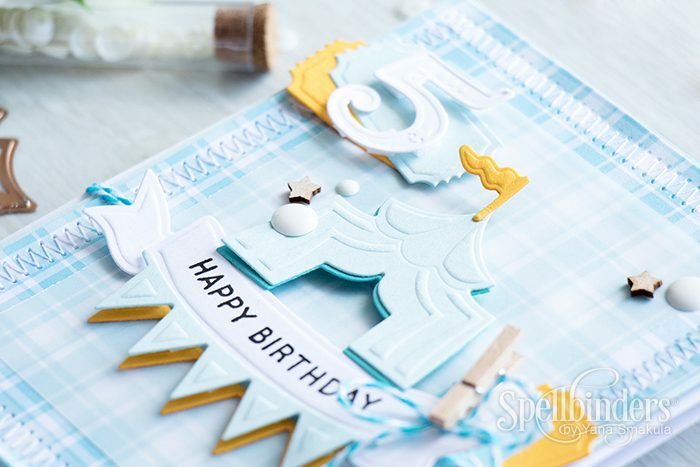 Today I have a fun Baby Boy 5th Birthday card and video tutorial showing how to easily add colored shadows to any die cuts featuring dies from Spellbinders! 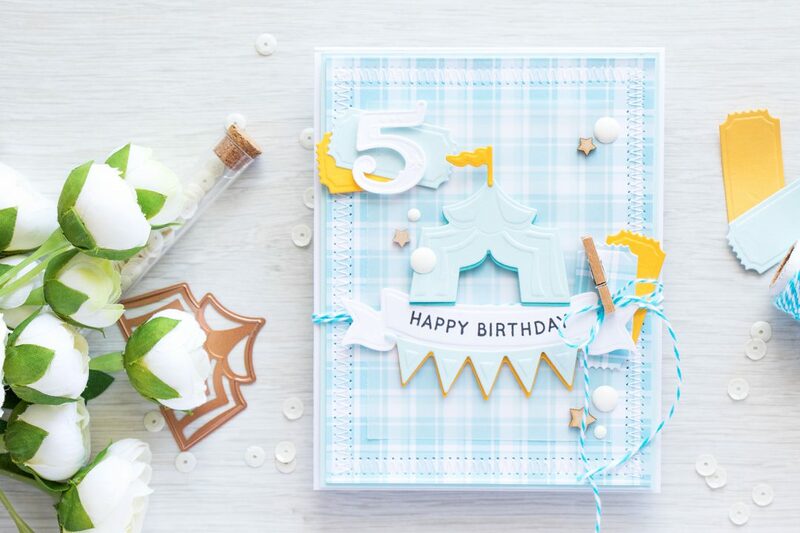 I am also using a new Prizm die cutting & embossing machine from Spellbinders – its the cutest little tool ever! Very portable and affordable die cutting machine. 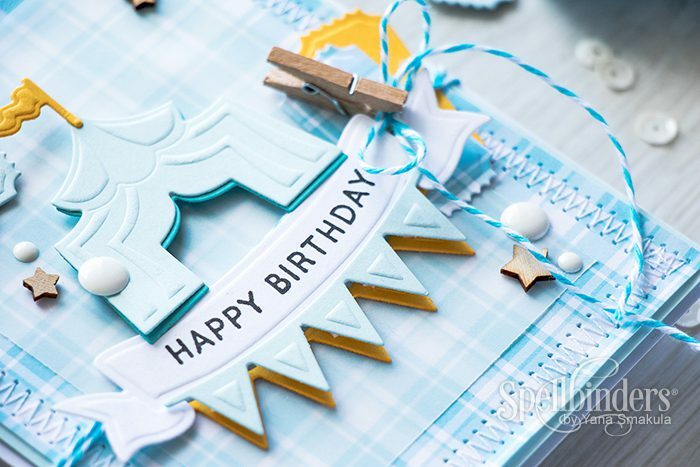 By die cutting any shape twice out of two different colors of cardstock and offsetting the top shape you can create an interesting and beautiful drop shadow effect, and whats fun – you can make that shadow any color you want. To create this card I used several dies from Spellbinders and die cut them twice. The circus image as well as the banner garland were first cut out of light blue cardstock and I also die cut an additional shadow layer for each using a darker blue cardstock for the circus and yellow for the garland. My card is a Happy Birthday one for a little boy who turns 5, but this technique can be applied to so many other projects and themes. 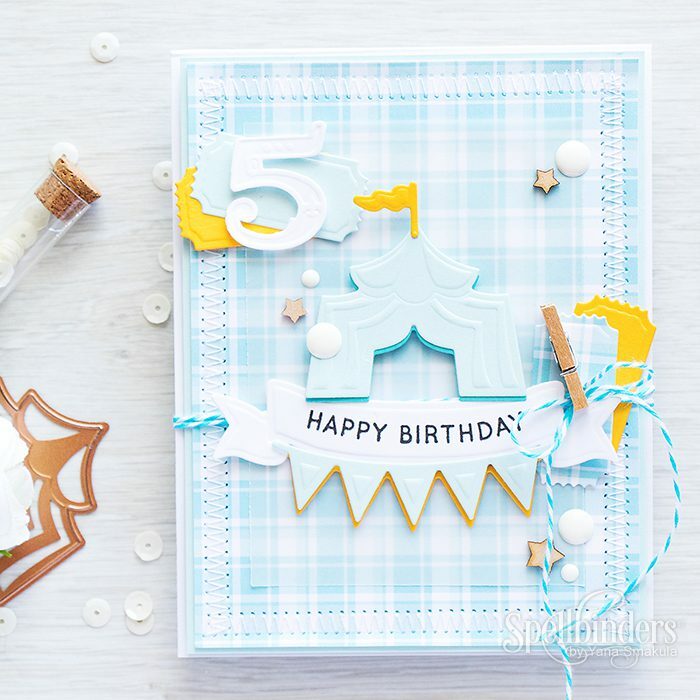 Im not a fan of baby cards, but this one is wow!! So classic baby boy feel. Cool! Oh my gosh! This is a work of art- from the stitching to the color choices, to all of the detailed elements u used on this! I bought a prizm not too long ago, based on your sneak peek video pre-release and I love it! I have a cricut and so many cartridges, so i didn’t want another machine for the big stuff…the prizm is perfect. And just when I told myself I was going to “chill” on ordering any more dies for a bit (til I play with all the ones I already picked up), u show how the banner dies and the amused circus pennants fit perfectly together! You r so talented! I always love seeing a new post from u in my inbox, and this is among the best yet. I had to drop a line to tell u how much I love the card ( and my prizm, thanks to u)! Have a fabulous day! oh my goodness! Thank you so much, Julie! Its comments like yours that make me want to do more! Thank you, thank you, thank you! I love die cuts on cards. I’ve never tried to off-set my ides to make a shadow and am anxious to give it a try! This really is a very happy card. The receiver will surely adore it! Thanks for the inspiration!